Herentals Private College in Beitbridge. 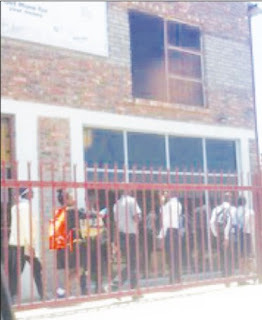 BEITBRIDGE – Form 1 to 5 pupils at Herentals Private College in Beitbridge are allegedly all learning from one open hall that is not partitioned and pupils staged a demo on Monday over the issue. A caller told The Mirror of the incident and a reporter got there as the pupils were making rowdy noise. The pupils are learning from one big hall in the industrial area understood to be rented from National Foods. When contacted for a comment, the school head, Joyce Mapurisa said the matter has nothing to do with The Mirror. “Vanhu veMirror munopinda papi ipapa. Mune connection neni pakudii? (What’s The Mirror’s stake in this matter? )”, she said before she hung up her phone. The pupils said that the one open hall is not conducive for learning and it has no ventilation. The rowdy students accused the head of calling the soldiers to come and beat them up. “She was calling the soldiers to come and beat us up. We are not going back into the classrooms,” declared the pupils. “Ndokuroveraichii, kutimaparayei, chamatadzachii, let’s get inside the classroom and discuss the matter, no one will lock you inside,” responded Mapurisa. The school guard Alex Pondiwa told the school head to let students who were threatening to leave the school go. “Iwe Mapurisa iwe, vasiye vaende, kana vasingade kudzidzirai ipapo (Just allow them to leave if they do not want to learn from there,” said Pondiwa.